1. Grind all the ingredients of red chilly chutney to fine paste. Add water if required. 1. Heat oil in a pan and add tomatoes and the puree and mix well. 2. To the mixed tomatoes and puree add the dabeli masala. 3. Once the mix masala starts to appear dry, add the potatoes. 4. Mix well and then add the salt, sugar and lemon juice. 5. Mix well and cook till the whole mixture becomes dry. 6. Spread the mixture on a plate; sprinkle the peanuts, Pomegranate kernels, sliced grapes, half of the sev and some coriander. 7. Slit the pav horizontally cutting through knife. 8. On one side spread the red chutney and tamarind chutney on the other side of the open pav. 9. 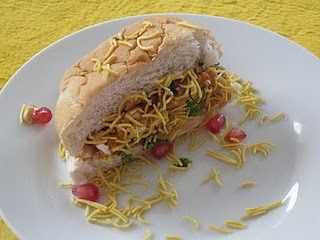 Stuff the decorated potato dabeli masala in between the two chutneys. 10. Place the stuffed pav on the hot tawa. 11. Press lightly and toast on both sides till it gets heated through and becomes slightly crisp.